Choosing a real estate agent who is not committed to forming a strong business relationship with you. Making a connection with the right real estate agent is crucial. Choose a professional who is dedicated to serving your needs – before, during and after the sale. Making an offer on a home without being pre-qualified. Pre-qualification will make your life easier – take the time to speak with a bank or mortgage representatives. 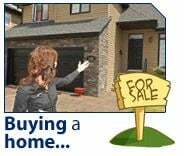 Their specific questions with regard to income, debt and other factors will help you determine the price range that you can afford. It is one of the most important steps on the path to home ownership. Not knowing the total costs involved. Early in the buying process, ask your real estate agent or mortgage representative for an estimate of closing costs. Title insurance and lawyer fees should be considered. Pre-pay responsibilities such as homeowner’s association fees and insurance must also be taken into account. Remember to examine your settlement statement prior to closing. Limiting your search to open houses, ads, or the Internet. Many homes listed in magazines or on the Internet have already been sold. Your best course of action is to contact a real estate agent. They have up-to-date information that is unavailable to the general public, and are the best resource to help you find the home you want. Thinking that there is only one perfect home out there. Buying a home is a process of elimination, not selection. New properties arrive on the market daily, so be open to all possibilities. Ask your real estate agent for a comparative market analysis. This compares similar homes that have recently sold or are still for sale. Oh, by the way… whenever you come across people who are thinking about buying or selling their home and would appreciate the level of service I provide, I’d love to help them. So, as these people come to mind, just give me a call with their name and business number, and I’ll be happy to follow through and take care of them for you. Please contact me if you have any questions about buying a home in Grande Prairie or elsewhere in Alberta. The current market is definately a buyers market. With almost 6 months of supply, prices are still coming down. The interest rate is still low... So call me to help you buy your new home.